Murder Mystery Solved with Trig! The murder of Maria, whose body was conveniently found at right angles to Leg Streets A and B, has been solved! Investigators found the weapon across the river, apparently thrown there by her assailant while he was running down Leg Street A in an attempt to escape. A quick thinking officer (who had majored in math at the police academy) was able to calculate an angle measure for the angle made by the throw from the perp and the street leading to the victim. Another savvy investigator was able to determine the distance from the suspect to the location of the attack. With the mathematical evidence in hand, investigators were able to triangulate a conviction. Math teachers everywhere weighed in, saying it has the proportionate ability to change the way investigators do business! Dimensions of the prisoner’s defense will be released at a later date. Film at eleven. Okay, so I don’t really have film (we forgot to assign the job of reporter!) What I do have are a room full of kids who can now set up the proper proportions for trig problems! Me: Okay leg A, are you opposite or adjacent to angle b? We were able to sort out the definitions, and the students holding the leg signs got pretty good at determining whether they were “opposite” legs or “adjacent” legs. A big moment came as students noticed that they could be opposite OR adjacent. More importantly, they were able to articulate WHY the status would change. More importantly, they were able to articulate WHY the status would change. Scene 2: The next six students were given the cards. This time, I stood back and let the first group help position the players. A little skirmish ensued as Leg A and Leg B were being positioned. After a brief discussion about whether or not leg locations could be interchangeable (did Leg A have to go in the same place as the first triangle? ), it was decided that as long as a leg were placed on each side of the 90 degree angle, it didn’t matter what we called them. The opposite and adjacent discussion began again. It was fun watching students correct these new players, or making them guess by giving them tantalizing clues! After a bit more discussion, the students determined that we needed an angle and we needed the distance from the body to the suspect to set up a proportion to solve for the distance. Two students were dispatched with the piece of crime scene tape that had been held between the victim and the suspect (Leg A, for those of you following along). Twelve inch square floor tiles assisted in the crime scene measurement. I used my oversized protractor to come up with the angle measure, and we were ready to set up some proportions! 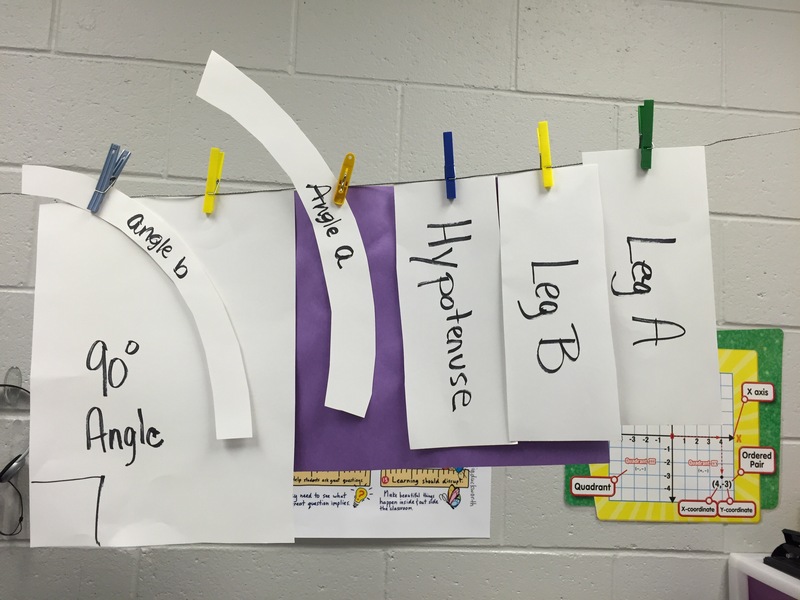 Back inside the room, our eager detectives checked their trig proportion info sheet (yes! They used their NOTES!) and settled on cosine, adjacent and hypotenuse. I stood back and watched them argue over who was going to set up the problem, exactly how to set it up, and how to enter the information into the calculator. Then I watched them convince one another which answer was correct. Concrete to representational to modeling AND peer tutoring…I love it! I would say that a murder wasn’t the only thing that got solved today!